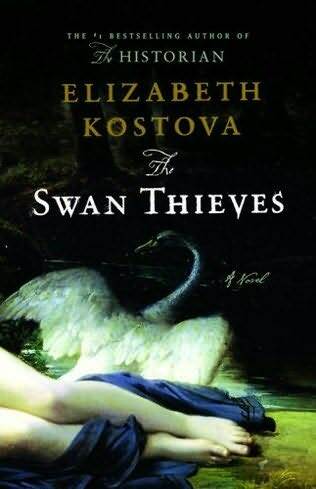 In Elizabeth Kostova’s second novel, Swan Thieves, Robert Oliver, celebrated artist, brandishes a knife at a painting in the Impressionists wing of the National Gallery of Art in Washington D.C. Psychiatrist Andrew Marlow is then recruited to oversee Oliver’s mental rehabilitation. Soon after giving Marlow permission to question the people of his past in order to aid his recovery, Oliver stops speaking altogether. Marlow’s journey takes him to the various women in Oliver’s life, most prominently his ex-wife, Kate, and girlfriend, Mary. Their experiences depict Oliver as a man whose passion for art is unrestrained and sometimes destructive, compromising the relationships in his life as he frequently loses himself entirely in his work. His secretive nature draws people to him, until they get so deeply entrenched in his life they can’t escape. While he moves forward into artistic frenzy, those left behind must pick up the pieces of fragmented relationships. Kate and Mary both take over storytelling at points in the book—Kostova marks the name of the current narrator at the top of each chapter, starting from the beginning, even though no one but Marlow narrates until chapter 12. These shifts in perspective are also broken up by letters, centuries-old correspondences between a woman, Beatrice, and her uncle, Olivier, both artists themselves. Oliver had the ancient letters, written in French, on his person and obsessively rereads them while under Marlow’s care. They are dispersed within the text in the order that Marlow reads them, as well as when they were written back in the 19th century. As the novel moves on, the past becomes more concrete as specific scenes unfold, that help audiences understand the letters in more depth. Marlow soon realizes that to solve the puzzle of Robert Oliver, he must first uncover the mystery behind the painting he attacked, “Leda” by Gilbert Thomas. Soon the past and present are reconciled into a single story, as the letters of Beatrice and Olivier, written during the time the painting was produced, help to shed light on the situation. This painting is a depiction of the mythological story of Zeus coming to Leda in the form of a swan. Leda would then give birth to Zeus’s daughter Helen, whose abduction by Paris would spark the Trojan War. Kostova describes the array of artwork in this book so vividly, that I felt compelled to look up the paintings online. I was disappointed to find that Gilbert Thomas, his self-portrait, and the “Leda” painting didn’t exist (the painting on the cover of the book is an 1832 work by François-Edouard Picot). This makes Kostova’s exquisitely detailed depiction of the painting even more remarkable. She describes the form of Leda before moving into her vision of the swan. But Kostova’s ability to express detail vastly limits the pace of the story. At first you feel as if the descriptions are characteristic of the mind of the main narrator, Marlow, and that his painter’s eye causes him to always be focusing on the minute details. As others take turns to tell their stories though, the same painstaking descriptions are present. I appreciate the author’s efforts to depict a scene, but the slow, leisurely way in which the story moved along contradicted Marlow’s urgent desire to get to the bottom of the mystery. Audiences will read it quickly, not necessarily because it’s an easy read, but because they are more eager than Marlow to see how it will end. After Kostova’s bestselling debut novel, “The Historian,” won many fans, her second book was highly anticipated. And while I found “The Swan Thieves” to be a worthwhile read, it was not what I expected based on her first work. “The Historian” blends history and horror in a fantastic telling of ancient Dracula and modern mysteries. By the end of that book you are not only convinced that the vampiric stories are based in fact, but that anyone can uncover this truth by embarking on the right treasure hunt. Past and present events are each given appropriate coverage, creating a smooth tale that makes transitions easily across time. On the other hand, the time-jumping, historical fiction aspect of “The Swan Thieves,” seems forced. The dynamic relationship between Oliver and his art, as well as the people in his life, is compelling and beautifully done. The parallel plotline of 19th century Beatrice and her uncle doesn’t fit as cleanly into the book. Though Kostova does make clear why she inserted those characters, if a couple details were modified, they could be cut completely without any detriment to the writing. While jumping between historical facts and present plots worked well for “The Historian” as it referenced true historical figures, the major historical developments and characters in this novel are fictitious, making it more superfluous. More focus could be put on character and relationship development, rather than catching up readers on the necessary history. While I was disappointed in some aspects, I would still recommend this book, though with that cautionary word for “Historian” lovers. Possibly if I hadn’t had certain expectations going into this read, I would have been more impressed. Kostova, a Yale graduate with a MFA degree from the University of Michigan, is still a master at telling a story that is sensational and interesting, without resorting to over-the-top scenarios or cheap dialogue. “The Swan Thieves” will appeal to your emotions as you relate to the characters and care about their lives, while persuading your intellectual side to delve into art history. It is one of those novels that will dominate your thoughts until you take the time to complete it—so free up your schedule before losing yourself in this thrilling mystery.